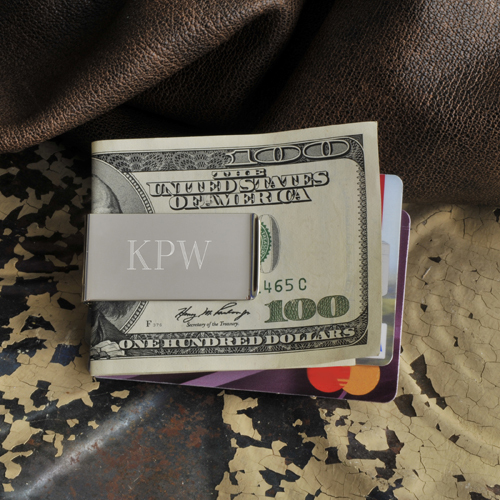 * Large and sturdy enough to hold bills and credit cards, this handsome personalized No-Slip Money Clip lets you dispense with bulky wallets. * Simple and contemporary in it's "M" shaped style, this silver plated clip can store cash separate from credit cards, ID or anything else you want to slip into this useful 2-sided clip! * Includes space for recipient's name or initials. * Measures 2 1/4" x 1" x 3/8". * Personalize with 2 lines of up to 12 characters per line. 2.25" x 1" x 0.375"
This product is shipped from our warehouse in Medina, MN, USA.